Territory : In the 1890es, French territorial expansion in West Africa reached its climax. 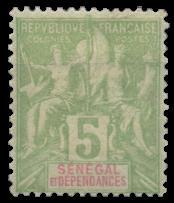 The Upper Senegal had been administratively seperated to Senegal, but her governor had to report to the Governor of Senegal. Within Senegal proper, Futa Djalon was declared a French protectorate in 1897, with it the French pacification of modern Senegal was completed. Mauritania administratively remained part of Senegal until 1920, much of it outside of French control until into the early 20th century. Economy : In contrast to the Upper Senegal (modern Mali), Senegal was under civilian administration. The French administration protected the Senegalese markt against non-French imports. The construction of railroads, since 1880, in combination with the excelle4nt port of Dakar, facilitated the expansion of the cultivation of crops for export. In 1911, Senegal had a population of 1,247,300. Society : a number of institutions of higher learning were established in the Quatre Communes, among them the Ecole Normale William Ponty (Goree, 1913). World War I : the residents of the Quatre Communes, as French citizens, were subject to military conscription. In the other regions of Senegal, the French recruited volunteers.